A warning badge keeps showing on my "Developer Story" tab that states: "You are open, but not actively looking for a job. We need more information before sending you matches." 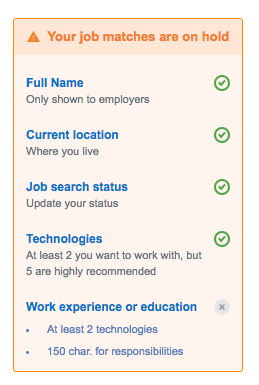 When I click either the "Developer Story" tab or look at my "Job Match Preferences", nowhere does it prompt me nor show me where exactly any new information is needed. As far as I can tell I've completed all the information to the fullest extent. For reference, here is my developer story. How do I make this notification either go away or provide the cryptic information it's asking from me? It's rather annoying, it's not very clear, and apparently it says I won't be sent any matches until these phantom errors are fixed. I emailed Stack Overflow and they suggested that I post my question here. Thanks for the feedback! The bit we're missing for you is the 150 character description for a work or education item. Your current work item has 140 characters - which is close! But it appears you're not currently seeing the prompt, which is a bug :) We're looking into it now and will update shortly. Not the answer you're looking for? Browse other questions tagged support bug status-completed developer-story .